Back to drawing buildings. My friends know that for a long time I have wanted to do something on The Barbican, not quite finding out the way of being true to this fascinating building complex. After my first visit in autumn 2008, when I had recently arrived in London, it made me think of a sci-fi set up in which it was the only civilised remnant in a dystopian future London, like a sort of a Noah's ark of culture among devastation. However, like the Transformers there's so much more than meets the eye, and so massive it is the Barbican is full of secrets, hidden spots and nooks, a bit of a metaphor of London itself. So after many times wandering around the estate in my spare time, I went back to basics and, drawing inspiration from early works, resumed with the idea of giant straight forward Modernist creatures, something in between monsters and robots wreaking havoc on London. No hidden meaning, just postmodernist fun. 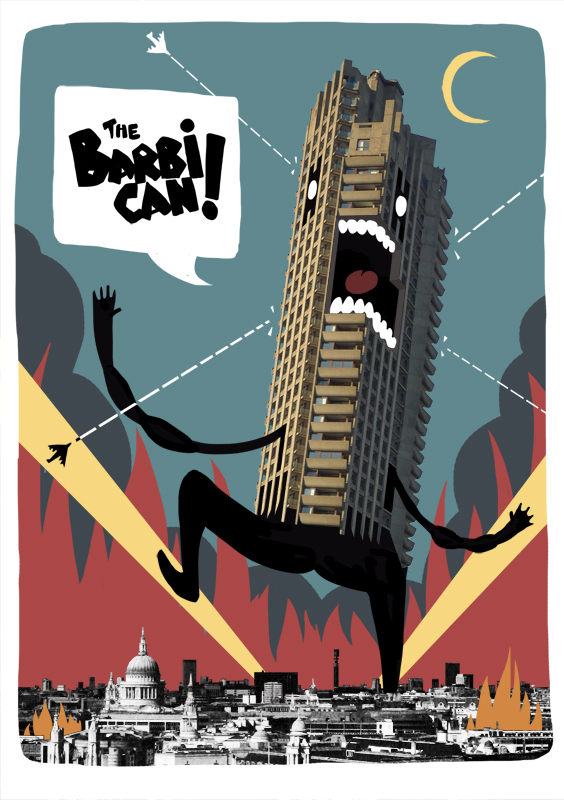 THE BARBICAN! 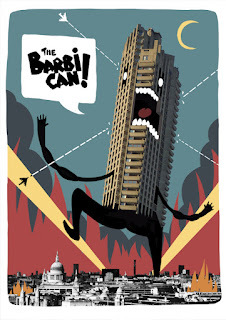 is one in a set of three postcards, with one of the towers portrayed as some sort of Brutalist Godzilla with a dangerous aversion to Classic architecture.